Lock in a great price for Crowne Plaza Englewood – rated 8.1 by recent guests! The room was clean and staff were friendly. My husband couldn’t get comfortable on the bed but I did not have a problem sleeping. The staff was very very welcoming and courteous especially Orlando and his staff. Breakfast was great. A lot of veriety and things to choose from and tasty. Nice, Calm, Cleam The location is in the middle of no where... but it was close enough to where we had to travel to. The location was excellent to New York. Having the indoor pool was a plus as well as the restaurant! so good i love the waffles !! i like the different juices. and the eggs and beacon was amazing. defintly second plate worthy. Everything was great loved the property. The property was clean and neat. Crowne Plaza Englewood This rating is a reflection of how the property compares to the industry standard when it comes to price, facilities and services available. It's based on a self-evaluation by the property. Use this rating to help choose your stay! Located less than 3 mi to New York through the George Washington Bridge, guests can enjoy being 9.9 mi to Midtown Manhattan and the Palisades Parkway which leads to Upstate New York. There is an on-site restaurant and free WiFi and parking are offered. All guest rooms include a flat-screen cable TV, a work desk and complimentary in-room coffee and tea. Crowne Plaza Englewood features an indoor swimming pool and a fitness center. Guests can also enjoy breakfast and or dinner at the Blue City Grille Restaurant & Bar, which serves American Cuisine. New Jersey Transit bus transport with service to Manhattan is 2,150 feet from the property and takes guests directly to midtown Port Authority in New York City. The Englewood Hospital and Medical Center is 2 mi away. Flat Rock Brook Nature Center, Bergen Performing Arts Center, The Shops at Riverside, and Westfield Garden State Plaza are all within 5.6 mi of the property. This property also has one of the top-rated locations in Englewood! Guests are happier about it compared to other properties in the area. This property is also rated for the best value in Englewood! Guests are getting more for their money when compared to other properties in this city. When would you like to stay at Crowne Plaza Englewood? Bed type cannot be guaranteed as it will be allocated upon arrival based on availability. This room features cable TV, a desk, and a tea and coffee-maker. 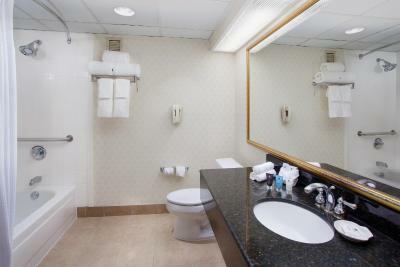 This room features a lowered vanity, raised toilet seat, shower seat, and shower grab bars. This room features a seating area with a sofa bed, cable TV, a desk, bathrobes, and a tea and coffee-maker. House Rules Crowne Plaza Englewood takes special requests – add in the next step! Crowne Plaza Englewood accepts these cards and reserves the right to temporarily hold an amount prior to arrival. The only issue I had with the stay was that because hotel was booked, the room next to me had a family that was loud especially the 2 kids. The kids did not stop till 1am after me and other guests had to complain. Then in the morning the mom and her boyfriend were fighting and pushing each other around the room. Close to where I live, clean property. Pool too full to be tempted to go for a swim. WiFi a bit unreliable (my husband couldn’t connect in the morning although I had no problem getting on the previous evening). Very comfy bed. Room was quiet despite location near highway. The pool's water quality was bad. And the real was very different from its pictures on the Website. Food was overpriced for the quality. Depending on the site used to look up info for property, it stated you had a hot tub/jacuzzi which we were really looking forward to but when we got there, there was nothing. If your looking for lunch food you shouldn’t stay here. The restaurant does not offer ANY type of lunch option. ‘Snack’ area was the only way we could get food to eat during the day and the options were extremely limited. No pool towels in the pool area the room where the pool was freezing and not very clean. The restaurant was a bit pricey but food was good. Ckeaning staff spoke no English and was very rude when asked to bring towels to our room. The AC was too loud. Went on and off on it own the whole night. it was either too cold or too hot... The price was too expensive for us. Hi I travel to this hotel with my son to visit my sickly mother. My son is autistic and at times has tantrums. My son was actually singing my mom and I was laughing. Than we get a knock on the door telling us to keep it down. I called front desk outrage because my two year old isnt allowed to sing or talk. Needless to say I requested to be moved since I felt the people next door where ridiculous. It was 9pm on a Saturday and they couldnt stand hearing a two year old. I dont know if this is a race situation since I am African American or just a horrible place to stay. I didn’t like the bathroom. It was not to my expectations. I liked the professionalism of your staff. The hotel is very old, the room has old and outdated furniture, it seriously needs an upgrade. The staff is very kind and the location is perfect.